St George’s Hall in downtown Liverpool is a grand Neoclassical building constructed between 1841 and 1854. Located across the street from the Lime Street railway station, St George’s Hall was designed first and foremost to host Liverpool’s triennial music festivals, plus concerts, dances and other cultural activities. The Liverpool Corporation raised funds for the new building by selling subscriptions, and in 1839 held a design contest to choose an architect for the hall. The winner was Harvey Lonsdale Elmes, a 25-year-old architecture prodigy who also happened to win another contest held at the same time to design a new building for the Civil and Crown Courts. 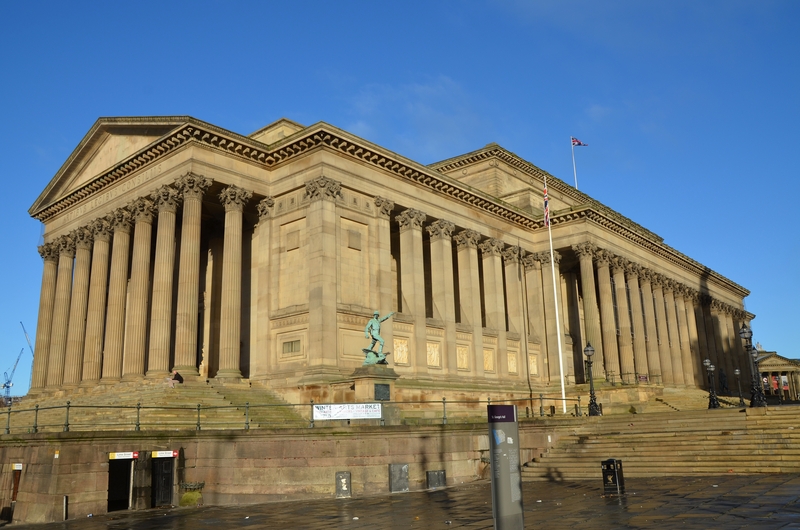 He suggested both projects be combined, and thus St George’s Hall became the only combined concert venue, ballroom and courthouse in the country, possibly the world. The Great Hall, a vast space 169 feet by 77 feet with 82-foot ceilings, was lavishly decorated with monumental red granite columns, statues and tunnel vaulting. 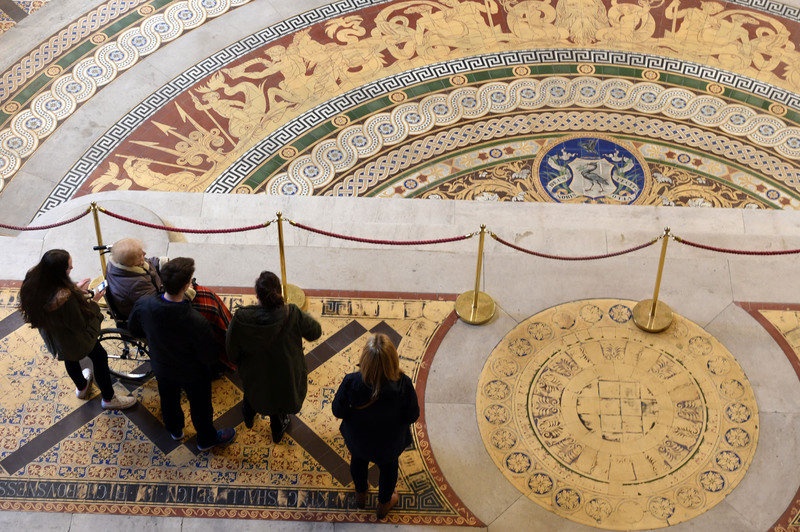 But its greatest glory is the floor, a riot of color composed of more than 30,000 tiles depicting Liverpool-related motifs including the liver bird, the symbol of the city, and maritime imagery like Neptune, tridents, dolphins and sea nymphs. The floor was installed in 1854, the jewel in the crown of St George’s Hall. 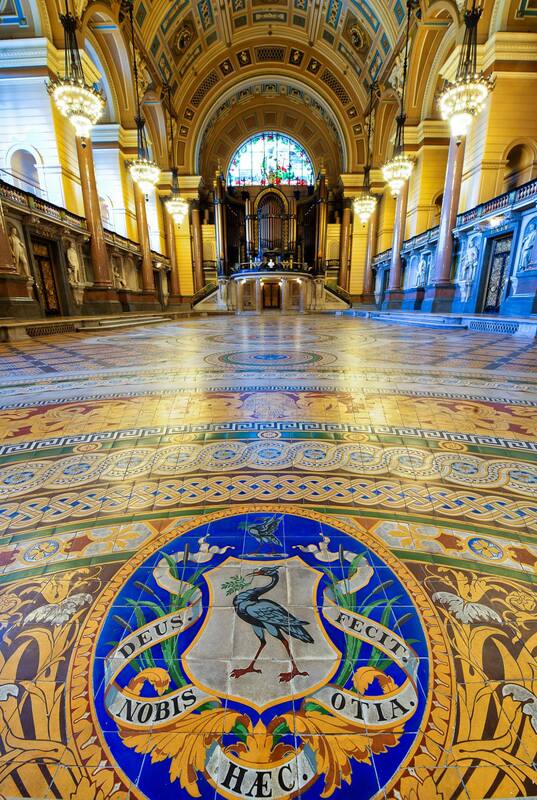 It is today the largest, most intricate example of a Minton tile floor. Founded in 1845, Minton, Hollins & Company specialized in decorative tiles for the floors and walls of churches, public buildings and private homes. Minton’s encaustic tiles — ceramic tile with multiple colors created by different colors of clay rather than different glazes — were all the rage in the Victorian era. They were considered the epitome of beauty and durability and won gold medal upon gold medal at trade shows across the globe. There are Minton encaustic tile floors in the Palace of Westminster, the Victoria & Albert Museum, prestigious hotels, elegant mansions and even in the United States Capitol. 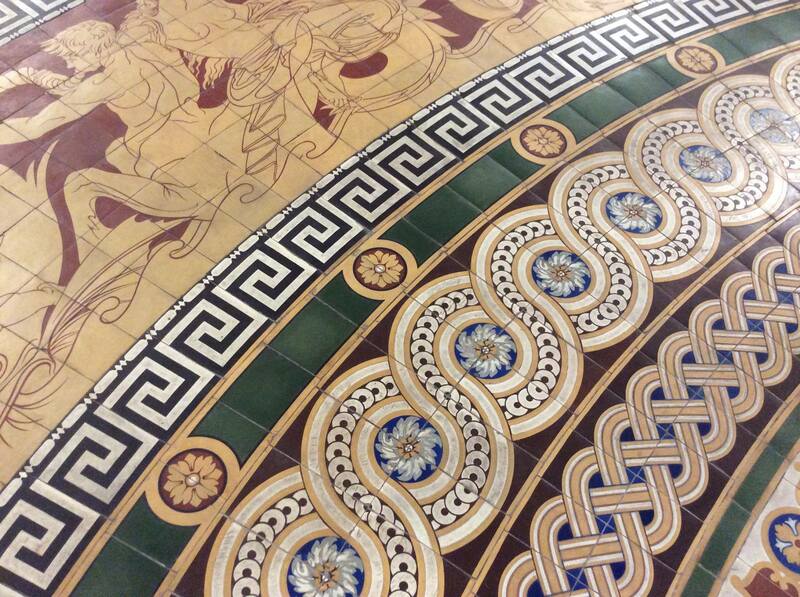 St George’s Hall only enjoyed the full glory of its Minton tile floor for a decade. A wooden covering was added in the 1860s to make it more comfortable for dances and other events. This reduced the wear and tear from thousands of foxtrotting feet over the decades, but it also left the tile unmaintained, not to mention hidden away. The building was all but abandoned in the 1980s when the courts moved to a new building. With no money for ongoing maintenance, the great neoclassical building, widely considered one of the most spectacular examples of the period in the world, rapidly deteriorated. In the 1990s funds were raised to repair parts the building, and in the early 2000s a major refurbishment project saved St George’s Hall. In 2007, the Grade I listed building opened to the public once again, restored to its former splendor. 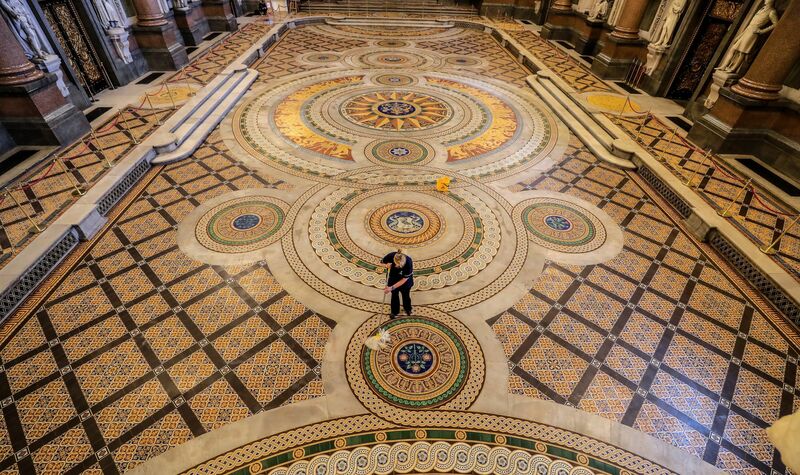 The Minton floor, however, was deemed too fragile to expose to all those feet again. It was covered with protective wooden panels which are very rarely removed. 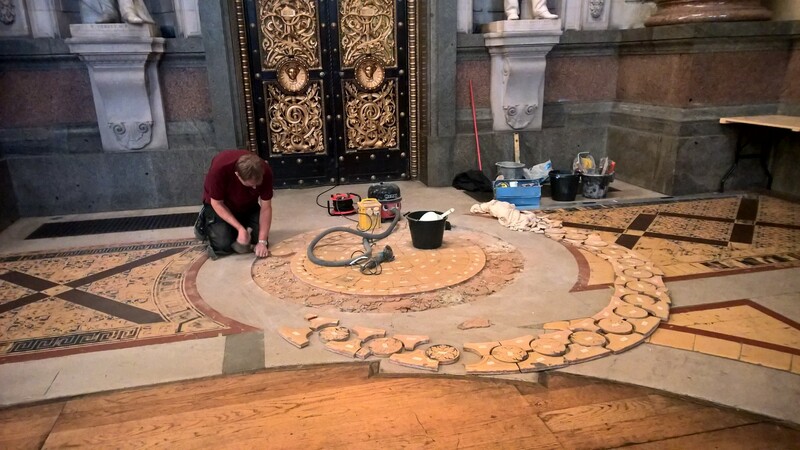 Sections of the floor received the first thorough restoration only in 2015. If you’d like to see the greatest extant Victorian encaustic tile floor, you have a brief window to do so. The floor will be uncovered and open to visitors only until Wednesday, April 18th. The entrance fee is £2.50 to view the floor from a viewing platform. There are also Walk the Floor tours (£10) and a Night on the Tiles option (£12, including a flute of prosecco). This entry was posted on Saturday, April 15th, 2017 at 11:25 PM	and is filed under Modern(ish). You can follow any responses to this entry through the RSS 2.0 feed. You can skip to the end and leave a response. Pinging is currently not allowed. “a Night on the Tiles”: well done, that man. By the by, blogger, there’s a story in my morning paper of some building workers discovering the tombs of Archbishops of Canterbury near Lambeth Palace. It’s a grand yarn: secret chamber explored by lowering a mobile phone to take pictures. Good stuff, eh? An ancient Roman would feel right at home on that floor. Beautiful! Why don’t they use clear protective cover, instead of covering it. Or wall mount somewhere else. Saint John’s Co-Cathedral in Valetta, for example, features an open inlaid marble tile floor for over 440 years now. Usually, they have ‘corridors’ in place, and punk-rock concerts are, of course, held elsewhere. The whole thing is an entire series of tombs, housing about 400 knights and officers, richly decorated with the COA of the knight buried below as well as images, often telling stories of triumph in battle. Looks perfectly sound to me. If we can walk on the Cosmati and tile floors of Westminster Abby which are in a far worse condition, why not St. George’s Hall? The other option is simply have a no shoes rule or provide over-slippers to visitors.